Home » Blog » Tom and Jane Dustin built a legacy from this home. “Tom and Jane Dustin built a legacy from this home,” the bold headline at the top of the commemorative panel reads. As you stand among the tall trees, listening to the music of the preserve, you can see that legacy is thriving still today. The Dustins helped launch ACRES Land Trust. 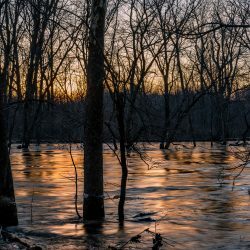 Inspired by the budding environmental movement, Tom Dustin, his wife Jane, and ten others pooled $5 each to establish the nonprofit ACRES Land Trust in 1960. For 32 years, Jane Dustin led ACRES, then an all-volunteer organization, the oldest and largest land trust in Indiana. The interpretive panel being installed, just off the main parking area at the Tom and Jane Dustin Nature Preserve. 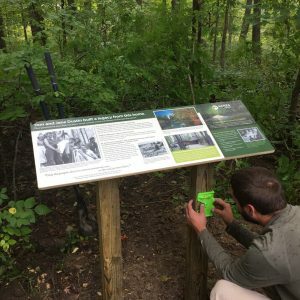 ACRES visitors at the Tom and Jane Dustin Preserve can reflect on the Dustins’ impressive and storied contributions to protecting the natural areas we enjoy and love today via an interpretive panel installed on the property. The sign welcomes folks from all walks into the Dustins’ former home/office, which is now the ACRES headquarters. It illustrates the past to inspire momentum for the future. If you are so moved by the Dustins’ story, consider joining their legacy. Become an ACRES member. 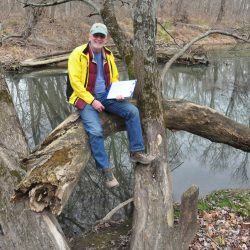 Once you’re a member, you can partake in special members-only events, like the upcoming Popp Nature Preserve open house. Join us in protecting the natural areas we cherish–land that will be protected, thanks to the Dustins, forever. Thank you, Dustin! It is a pleasure, an honor and our responsibility to continue your grandparents’ legacy – and we take the task to heart with great joy! Thanks so much for sharing your note. It’s inspiring to hear from you. Your request for a walking video is fun! We’ve shared some photos over the years, but perhaps you can image our challenge in capturing the character of their home, the office, in pictures. Perhaps video is what we need. Or a photo collage … I’ll see what we come up with and get back to you. Thanks for your request. We’ve sent your note along to both Sue and Barb. Many thanks for stopping by!